The majority of plastic products in the world today are manufactured by injection molding. However, fabricating molds can be prohibitively expensive and time-consuming. Fortunately, molds don’t need to be made of metal—they can be 3D printed. Download the Formlabs white paper on Injection Molding from 3D Printed Molds to find out how. Stereolithography (SLA) 3D printing provides a cost-effective alternative to machining molds. SLA parts are fully solid and isotropic, meaning that they can withstand the pressure of low-volume injection molding. Interested in other types of moldmaking with 3D prints? Check out our overview white paper that also covers thermoforming and casting with elastomers. 3D printed molds in aluminum frames. 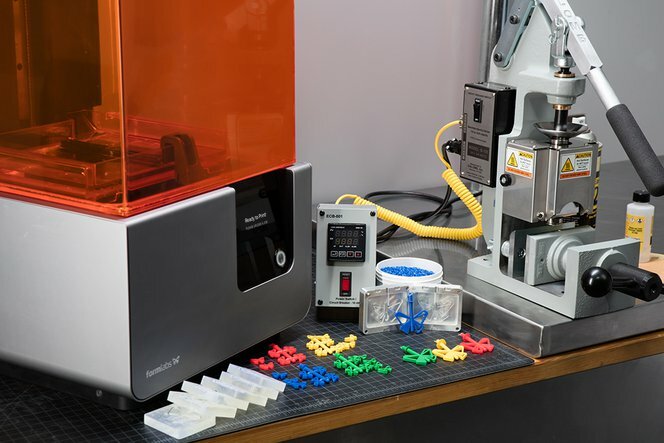 Formlabs partnered with Galomb, Inc., which manufactures affordable benchtop injection molding machines, to test molds printed on the Form 2. The molds were able to consistently produce small plastic parts, and showed no surface deterioration after 25 shots of low-density polyethylene (LDPE) plastic. Download the white paper to learn more about how to create 3D printed molds for low-volume, in-house injection molding.